It's a Herculean effort to see everything at CES. CES 2019. It's an equal opportunity to pick a favorite thing among the fantastic (and not so fantastic) things on the floor. after our days in press briefings, meetings, and walking the infinite-feeling convention floors-asked them what their favorite CES. Georgina, who so appeared to be the easygoing sort, strapped the double lub-dub beat and that humans just respond to the rhythm. You can tune and customize the double via a companion mobile app and it just happened to do the double I tried what about as finely tuned to my heartbeat at that moment as you could ask for. The effect was incredible. When I got my wrist out to try it out I had a "maybe my wife will like this" , Prior to putting it on I felt like it probably did not have much effect and now I'm planning on ordering one-I did not want to give the demo model back. Chris Hoffman, Features Editor: Luka, Picture Book. Luka is a little owl. Literally, it reads the book-you place a picture book in front of Luka and it reads the title. You start reading the words on the open pages. Turn to any page in the book and Luka immediately recognizes the page you're on and starts reading it. You do not have to buy books for this book. Even if you're busy. The tech behind this is surprisingly clever. Ling Technology Inc, the company behind Luka, scans at least 60,000 books are already in their database. When you open a page in a picture book, Luka sees the page with his camera, quickly recognizes the page, and starts reading the words. Luka comes with a built-in speaker and battery. It even responds to various actions-you can pat the owl robot's head and rub it for a cute reaction. Parents can even tell It's adorable. 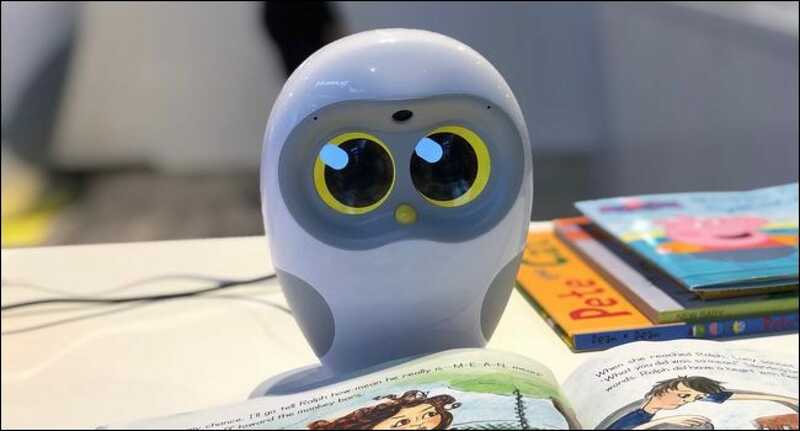 This smart owl launches last year in China, and now the company is working on a US launch later in 2019-the tech is ready to go. $ 199, but multiple models will be available at multiple price points. The SmartDesk is a sit-in computer and all the integrated hardware you need just plug it up and use it. It has an integrated keyboard and touchpad, as well as three 24-inch 1080p touch screen monitors. There are currently two configurations available: one has 16GB of RAM, a GTX1050 graphics card, 256GB SSD, and 1TB HDD; the other has 32GB of RAM, a GTX1060, and 2TB HDD in place of the 1TB found in the base model. Both feature 8th generation Intel Core i7 processor. But that's just the nuts and bolts of the SmartDesk. It also has a built-in wireless charger on the right side of the desk, and a mind-blowing gesture control panel that lets you control the PC without touching it. Cemtrex builds a custom software layer that runs Windows to track user movements, which lets you use simple hand gestures for things like zooming, scrolling, and even taking screenshots. It's the closest thing to minority report-level stuff that I've ever seen in a consumer product. There's also a small camera between the left and center monitors at the desk and functions as a no-foot document scanner. All you have to do is open the software and drop a document on the left side of the desk. Of course there is a burning question with this level of technology and integration: what happens if something breaks? Fortunately, the SmartDesk's integrated PC is completely user-accessible and upgradeable, so at least it's that. Otherwise, both models offer a one-year warranty on parts and six months on labor. The base model starts at $ 4,499, while the upgraded model will set you back $ 5,299. To learn more about how this desk really is, check out the Cemtrex site . Renters have always struggled to find smarthome devices. They can install their apartments without the landlord's freaking out-the-door door cam is a neat alternative to the company's traditional video doorbells. It's pretty much a digital peephole; installing it just takes the existing peephole and screwing on the door View Cam in its place-no permanent modifications. Better yet, while you have a look through the camera, you can not look at it. The coolest feature, though, is knock detection. You can still use the Door View as a doorbell and connect it to a Ring Chime inside, but if someone knocks instead, the Door View can detect and send you a notification. The Door View Cam Will Be Available at some point later this year for $ 199. CES is usually a place for showing off hardware, but the most innovative thing I saw in Vegas was a combination service and app. GPS coordinates. The idea is simple: the entire planet is chopped up into a grid of ten-foot squares, each and every one of which is given a permanent designation of three simple words. The Las Vegas welcome sign, for example, is "suffer.finds.awards." The ideal examples given were outdoor venues with wide spaces and few distinguishing features: you might say "meet me by the white tent" at a music festival and be less than helpful. But switch to "meet me at grass.billow.angry" and you have an easily-shareable location. GPS. Still, I think What3Words has the potential to be on everyone's phone in the next two or three years, becoming the biggest leap forward in personal navigation since Google Maps. The company's promising start, open API approach, and growing list of integration partners would certainly seem to suggest it.